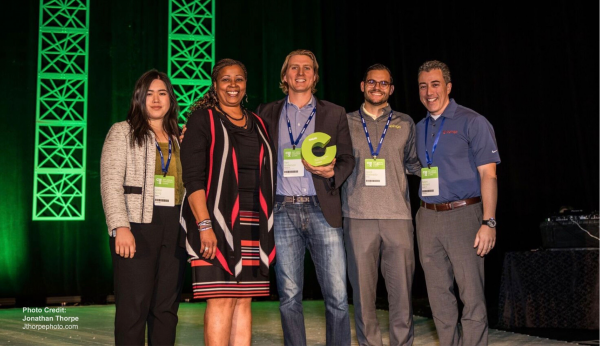 November 24, 2017, San Francisco – The National Association of College Auxiliary Services (NACAS) has named Tapingo, the leading mobile commerce application for college dining, as the winner of the Outstanding Business Partner of the Year Award. Tapingo has partnered with more than 200 higher education institutions to provide a more convenient dining experience for students and staff. Processing nearly one-hundred thousand express pickup and delivery orders a day, Tapingo provides a single app for all on-campus dining needs. Working with all food service groups and card systems, Tapingo offers real-time order information, menu management, trend data, and dynamic print throttling for efficient operations. The awards ceremony took place on Sunday, November 5, at The Broadmoor Resort & Spa in Colorado Springs, Colorado. This award was presented to Ben Anderson, Director of Campus Engagement, representing Tapingo for their commitment to supporting auxiliary services departments and creating positive student engagement. Since its founding in 2012, Tapingo has leveraged mobile technology to solve a key problem for students: lack of time. Whether confronted with long lines while racing between classes, needing a “midnight boost” during late-night study sessions, or faced with a lack of options when living off campus, students are increasingly in search of a new solution to meet their needs. With just a few taps, users can browse menus, order and pay, then schedule pickup or have their order delivered. Tapingo provides a streamlined buying process that benefits both the students and the campuses, while driving habitual purchase and eliminating operational inefficiencies. Today, Tapingo processes tens of thousands of transactions per day, and the average user utilizes the service more than five times per week. Serving 46 markets from Alaska to Miami, Tapingo is the ideal commerce solution for the on-the-go on-demand generation.